A conversation with Ben Frost and Tim Hecker. Photo taken by author. 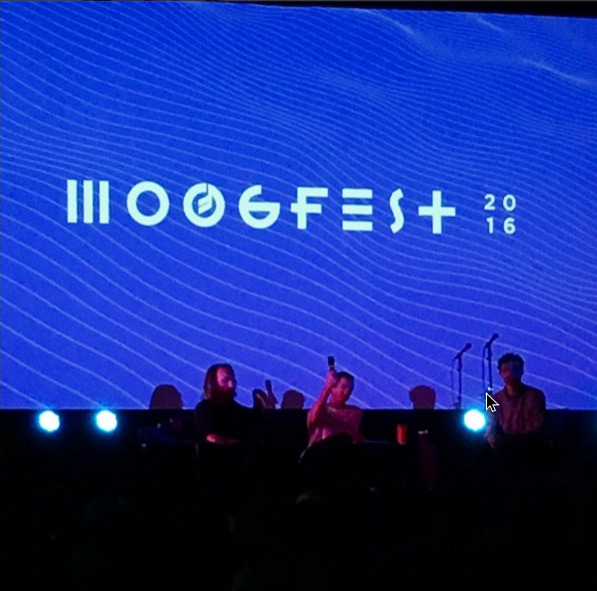 Today was a day to celebrate musical diversities of Moogfest 2016. Well, after a quick trip to the Moogfest Record Fair, presented by All Day Records, Merge, and some delicious food from one of the countless food trucks surrounding the downtown core. My music day began with Olivia Block at the Durham Arts Council PSI Theatre. This was a full aural experience, augmented by one pale white light illuminating the centre of the performance area. The theatre was an ideal space to showcase Olivia's electroacoustic composition. 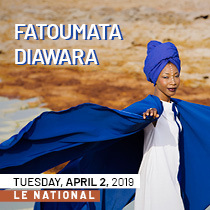 The sounds filled the entire space, bathing the audience in a repertoire of sound frequencies, ranging from the lightest whisper to an almost harsh noise level. It was breathtaking. Next, I headed over to the Carolina Theatre to get ready for Laurie Anderson. This was one of the performances I was most looking forward to at Moogfest this year, so I made sure to get to the theatre quite early. Most of the shows at the fest had been plagued by extremely long lines, so I definitely did not want to be shut out of this show. For real, Anderson's performance left me speechless. She was truly captivating, and had the audience hanging off of every word she said. It was so emotive, personal, funny and inspiring. I want to start a traveling fanbase that goes to all of her shows, so please get at me to start this club. Bonus points if you have a bus or a plane already. I needed to reflect after her show, and not listen to music for a while, just to let Anderson's performance sink in more deeply, and clearly the best way to make this happen was via the consumption of pizza. This was also a good time to prepare for the next momentous Moogfest moment, Sunn O))) outdoors, underneath the light of a full moon. Can you get a more legit Sunn O))) setting than that? The answer is no, not really. Picture it— fog rolling by, revealing the cloaked metal-drone gods. An ocean of fists raise to the air, being illuminated against the fog by the light of the full moon (and yes, this really happened).Their wall of sound being delivered by a literal wall of amps. 30, if I counted right? Ya, I know, seems like 30 amps is too much, but please, define "too much," in the context of Sunn O)))? More like "just right." Okay, maybe several people left once they began, but clearly they missed out on a religious experience. Watching this show made me feel #blessed. I never understood that hashtag before, but now, it's in there, deep, nestled beside Laurie Anderson's performance a few hours before. Quite a day. Wow. My evening ended with trips down hidden alleyways to a Party Illegal event. We can call it an off-Moogfest event. The place, Arcana, was a welcome little break from the hectic festival swing. It felt like a speak easy from a different decade, and full of fun folks displaying a fine southern hospitality. At points in the night I tried to sneak back to The Carolina Theatre to see other acts, but the block long line was a major deterrent, and I found myself returning to the sanctuary of Arcana and the Party Illegal peeps! Thank you for showing me the community-side of Druham's electronic community, it was a delight! One more (short) day to go! Julie Matson is covering the 2016 edition of Moogfest happening in Durham, North Carolina, and also hosts Beyond The Black Rainbow where she puts back the experimental back into experimental music every Monday at 4pm ET. Read her conversation with Moogfest festival director Marisa Brickman, and keep it locked to CJLO On Air and online to hear more of Julie's tales from Durham. Click here to check out highlights from Day One, and here for Day Two of the festival.